I have been using my Asus Zenfone 2 Laser 5.0 for quite some time and I'm very happy with its' performance! I heavily rely on it for Social Media postings, checking of emails and Youtube for Kyle Nash! I know I said I'm 100% happy, it doesn't hurt if the same Zenfone 2 Laser phone comes in bigger screen! Unboxing, my newest Asus Zenfone 2 Laser 5.5S! 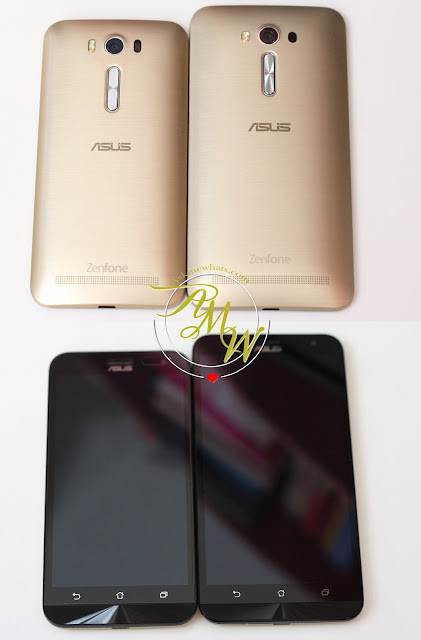 Zefone 2 Laser 5.5S looks similar to my Zenfone 2 Laser 5.0 particularly because I got both units on same Gold shade! Both has almost the same features except, the Zenfone 2 Laser 5.5 has bigger HD display (5.5-inch HD display, 1280 x 720 resolution to be exact). Earphones with different earbud sizes. Now let's talk about the camera, the cameras on both my Zenfone 2 Laser 5.0 and this one are both the same in terms of laser focus and 5mp front-facing selfie. Both comes with Laser autofocus. Thankfully, the 3,000 mAh Li-Po battery is also removable like that of my old one. Lesser squinting on my part due to bigger screen. Photos are captured a tad bit faster than my previous phone. Instant focus, a couple of seconds faster in focusing especially when I'm trying to take photos of my son who is extremely active. The bumped up storage of 32 GB is heaven sent especially for music and photo lovers like me! I have more storage space for Kyle's special moments. Best of all, it looks super chic for the price of Php8,995.00. I would imagine this priced higher than Php10,000! I will definitely recommend this to anyone who's look for a smartphone with loads of added value! For someone who never seem to get tired of my existing phone, I am eyeing on upgrading to Asus Zenfone 2 Laser 5.5S!